Please come out to support our Trojan Basketball Team as they travel to Jones County High School for a Holiday Tournament. 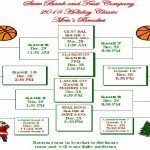 Our Trojans play Dec. 28th at 5:30. We will play Harris County. Our Trojans enter the Holiday Tournament with an overall record of 5-3.